Choosing the right streaming stick for your entertainment center is a big decision for such a small device. 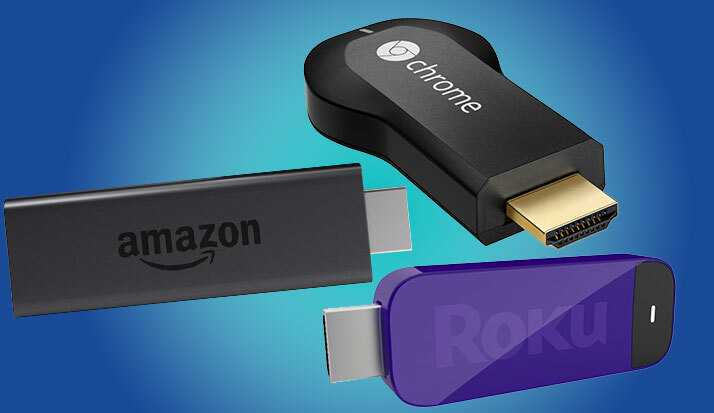 Fortunately, Amazon Fire TV, Google Chromecast and Roku Streaming Stick are three of the most powerful streaming sticks currently available. Since each of these devices are top-of-the-line, your decision may depend on your budget or familiarity with each developer. Amazon's streaming stick may be the obvious winner if you're already an Amazon Prime subscriber or Kindle owner because you can instantly stream Amazon Prime videos directly to your television (a feature that is also available on Roku but not Chromecast). The stick connects you to a variety of services, including Netflix, Hulu Plus, HBO NOW, Watch ESPN, Showtime Anytime, Pandora, PBS Kids and NBC News. You can also play games, mirror your phone or tablet and search by voice using the mobile app or optional voice remote. The device currently costs $34 for Prime subscribers and $39 for non-subscribers. Priced at $35, Google Chromecast boasts an impressive growing selection of apps, with everything from Netflix to YouTube and Polaris Office to TuneIn Radio. The streaming stick supports screen casting so you can view your Android device on the big screen. Rather than including a remote, you control your Chromecast from your Windows, Mac, iOS or Android device -- or by voice via select "Cast" apps. Not having a physical remote may be a deal breaker if you find yourself wanting to watch something when your smartphone is in another room. Roku's included remote has four different quick-launch buttons so you can access some apps on the fly, such as Netflix or Amazon. Roku has been in the streaming media game since 2008 and offers just about every service possible in its streaming stick. There are also a ton of apps available from unofficial channels if you find your selection is missing something. The stick is currently available for $10 off its original price of $49.99. Even with this discount, Roku is more expensive than the Google Chromecast and the Amazon Fire TV.